Vince is a renowned English singer who has stayed the course since winning a skiffle contest in the 1950s and offered a residency at Soho’s famous 2 I’s coffee bar, later joining Larry Parnes extraordinary stable of Artistes where he was given his “fast moving” stage name, his real name being Roy Taylor! In the years that followed the Parnes era, Vince toured on the cabaret circuit, and performed in theatre and pantomime. For five years he starred in the West End musical Elvis. In 1986, he moved to Fort Lauderdale, Florida, USA where he worked as a cruise director on American luxury cruise ships. 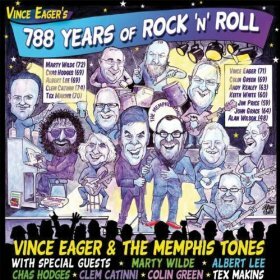 This selection recorded in 2011 and distributed on CD by Western Star records features some of the most gifted British session musicians as well as Vince’s touring band, The Memphis Tones.